Global Banking and Finance Review, has awarded BLOM BANK S.A.L. 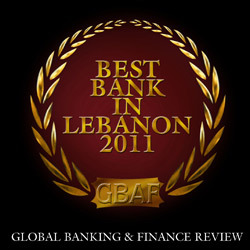 “Best Bank in Lebanon 2011”. BLOM BANK S.A.L. was chosen after a series of assessments by industry analysts on several important parameters. Founded in 1951 and known as BLOM BANK S.A.L. since 2000, it was with great pleasure that Global Banking and Finance Review awarded BLOM BANK S.A.L with the prestigious award “Best Bank in Lebanon 2011”. The bank has far ranging products/services to include commercial and retail banking, corporate banking, private and investment banking, insurance services and Islamic banking. The addition of mobile banking and the branch network spread shows that BLOM BAMK S.A.L. is going places and ensuring banking technology is to the forefront of the bank’s thinking. The last audited consolidated financial statements published by the Bank (end December 2010) showed a very strong financial position. Clarity, integrity, ambition, scope and reliability are all words that could describe the Bank. BLOM BANK S.A.L. also gives something back to the community with its support of social causes, corporate philanthropy and CSR initiatives. It also sponsors the BLOM Beirut Marathon. international bank with global reach. BLOM BANK S.A.L. has sound Corporate Governance standards achieved through accuracy, transparency and compliance. BLOM BANK S.A.L. has shown its commitment to Islamic banking by forming BLOM DEVELOPMENT BANK S.A.L. in 2005 and that entity has set very high standards in Lebanon. Throughout the Arab world and across the globe with its insurance arm, AROPE INSURANCE, the bank is able to offer full insurance services in Lebanon, Syria and Egypt. The range and quality of the products/services offered by BLOM BANK S.A.L.is the envy of other banking groups around the world. These are the main reasons the judging panel at Global Banking and Finance Review had a simple task in awarding “Best Bank in Lebanon 2011” to BLOM BANK S. A.L. We, at Global Baking & Finance Review, decided to reward those institutions who stand out in their particular area of expertise in the finance industry. The awards will become a benchmark for performance and reliability within the banking and finance world and they will provide an accurate indicator of the leading organizations in this world. They will also recognize achievement, challenge, progress and inspirational change within the world of finance across the planet. Global Banking & Finance Review will promote the winning entities through our own website, and through our media partners around the world, thereby informing, through the medium of the world wide web, a comprehensive audience of the successful nominees in a number of specific categories. The site www.globalbankingandfinance.com receives in excess of 100,000 page views every month. The successful organizations have been decided by our awards panel headed by our editor in association with various industry analysts. The awards selection panel used a wide range of criteria to come to their decisions on the 2011 award winners. Some of the general criteria include Transparency, CSR Initiatives, Corporate Governance, Sustainability, Innovation, and Customer Service. Depending on the industry sector, some of the specific criteria used included Market Capitalization, Earnings per Share, Price/ Earnings ratio, Total Revenues, Profit before tax, Net income, Operating Profits, Total Assets, Tier 1 Capital, Total Deposits, Total Loans, Loan to Deposit ratio (Deposits / Gross Loan Ratio) , Non Performing Loan Ratio & Non Performing Loan and Coverage and Provision.